Rashida Abdulai is a Senior Associate and Solicitor-Advocate within the renowned International Arbitration practice at international law firm Hogan Lovells. She acts for multinational companies on complex, high-value international business disputes across a range of industry sectors including energy and natural resources, telecommunications, consumer goods and banking and financial services. As a strong proponent of diversity and inclusion in the legal sector, Rashida is a founding member and Co-Chair of the UK’s first inter-law firm diversity network, NOTICED, which is an initiative aimed at promoting ’Networking Opportunities to Integrate, Celebrate and Educate on Diversity’. NOTICED has welcomed more than 200 junior and aspiring lawyers to its high profile events over the past two years. 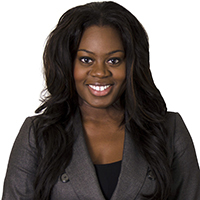 Rashida is also a committee member of the Law Society’s Ethnic Minority Lawyers Division. Of mixed Caribbean and African descent, Rashida has particular interests in these geographical regions and the role of law in economic growth and development. Rashida is a key member of Hogan Lovells’ Africa practice and regularly publishes articles on important legal developments and issues of interest to businesses operating in Africa, and has participated as a speaker and panellist at a number of legal and business forums both locally and internationally, including the East Africa International Arbitration Conference, held in Nairobi in July 2014 and in Tanzania in April 2015. Rashida sits on the working committees of International Lawyers for Africa (ILFA) and Africa International Legal Awareness (AILA), non-profit organisations which work to build legal excellence and foster sustainable development across Africa.